There are a good number of parking spaces for blue badge holders outside the Windmill Entertainment Centre within the public car park. Please note that during the summer the car park is busy. 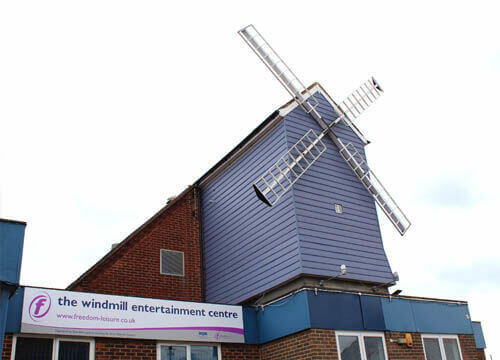 There is good, level access in to The Windmill Entertainment Centre via automatic doors. Entry into the auditorium is good with large, double doors and a wide foyer. There is raised seating within the auditorium with space for 4 wheelchairs in the front row. It is usually possible to arrange for a combination of wheelchair and standard seating to allow patrons to sit together, so please state any requirements you may have when booking. Staff at our venue are always happy to assist. We have a toilet for wheelchair users which is located in the main foyer. There is a hearing loop system in the auditorium and the box office. To avoid possible disappointment, patrons with any special requirements are strongly advised to contact our box office to book in advance as spaces are limited. This is so that we can best accommodate your needs. For all special requirements, please ensure that your needs are known to us at the time of booking your seats.